I have my tried-and-tested ports of call in Burgundy but every time I go I try to visit a few producers who are entirely new to me. I can’t remember one as immediately thrilling and convincing in terms of wine quality as Domaine Gérard Mugneret in Vosne-Romanée, encountered recently. I don’t often find myself using the word ‘beautiful’ in a tasting note, and never before about a mere village wine. But it seemed the right description of Mugneret’s Vosne-Romanée 2012, a wonderfully pure expression of this starry village blended from no fewer than 15 different parcels all over the commune, the Pinot Noir vines being between 40 and 50 years old. ‘Gorgeous. What more could you want?’ I also wrote in my enthusiasm, even though I was tasting it towards the end of its long élevage in old casks so it was a little bit reduced. This is the domaine’s quantitatively most important wine, of which almost 1,300 cases are made each year from a total of 2.58 ha. Gérard’s father René was the very first vigneron signed up back in 1968 by the redoubtable Becky Wasserman of Le Serbet, who represents so many of Burgundy’s finest wines. She describes the wines as ‘from generation to generation quiet, calm, and they age beautifully; a sort of a Côte de Nuits Lafarge’. High praise. René was an uncle of Dr Georges Mugneret, whose widowGerard_Mugneret_s_bottles and daughters run the estimable Domaine Mugneret-Gibourg along the Vosne backstreet. The Mugnerets’ house and cellars lie round a neat yard just downhill of the church and the main offices of the world-famous Domaine de la Romanée-Conti, but Gérard Mugneret wines are very much under the radar. Until now 70% of them were sold directly to individuals, leaving just 30% of the barely 3,000-case production to be shared between one British and a handful of American importers. Gérard’s son Pascal, who now runs and lives at the domaine, intends to reduce the proportion sold direct to 40%, but to judge from his father’s work labelling and packaging bottles like these just off the main cellar during my visit, satisfying the lucky buyers on their mailing list is still a time-consuming business. It was his previous life, seven years as a Phillips engineer, including a spell in Hatfield, England, that is responsible for Pascal’s excellent English. But since then his life has changed utterly (although I much appreciated the ease with which this ex-engineer sorted out a problem I had with my Blackberry). He found himself living in Orléans in northern France with his teacher wife, another Burgundian, and drew up two columns to represent what he liked and disliked about being an engineer. The result was that, after navigating their way round the geographical complexities of the French teacher supply system, they were able to return to the Côte d’Or and Pascal, who presumably understood much of the science already, enrolled on a brief oenology course in Beaune. 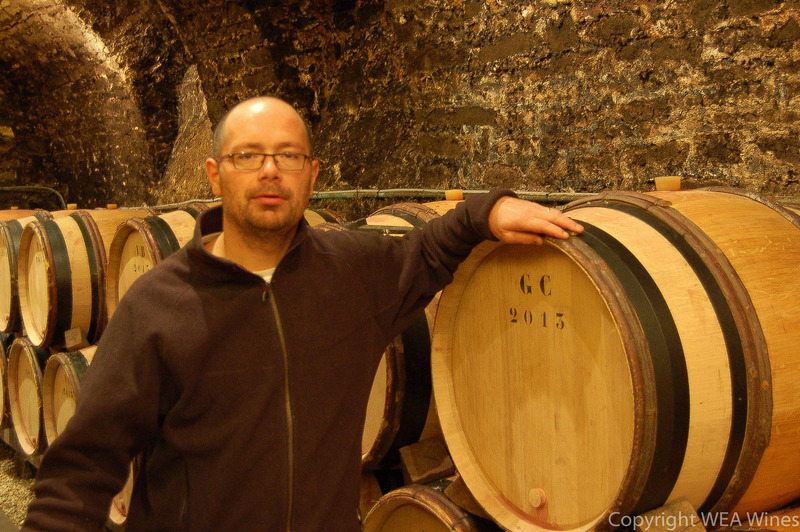 He was spoilt with his first vintage, 2005 – a breeze for Burgundy’s vignerons. Recently they have all been tested considerably with vintages 2011, 2012 and 2013 presenting a succession of meteorological challenges, although admittedly hail has hit the Côte de Beaune well south of Vosne far harder than it has the Côte de Nuits. Unlike David Clark, Pascal Mugneret is able to grow and vinify almost 300 cases-worth of grand cru grapes every year, thanks to his family’s status as sharecroppers of the Dames Mugnerets’ Échezeaux (and a parcel of Vosne). As with so many family domaines in Burgundy, other family members own a share of the vineyards and have to be paid rent for them. The hope is that they will eventually sell, and, as Pascal explained in the wake of this year’s exceptional price hikes, ‘It’s the anticipation of the cost of buying relatives out that has forced up prices’. If it keeps land in the hands of those who make the most from it, then I for one would not complain too loudly.